Neena Sharma, Tribune News Service Dehradun, February 13, 2009. Padyatra (long march) to inform the people. Addressing the rally, Radha Behan, who spearheads the movement, charged the government of failing to come up with a people-oriented water policy in the absence of which the problems of the people have grown manifold. "The government needs to understand that the issue is directly related to "jal, jungle and zamin" (water, forest and land). By taking a unilateral decision on the construction of hydro-power projects on our rivers, it has posed a threat to the livelihood of our people," Radha said. "As if people's interest does not count, the Gram Sabha (village council) members are not taken into confidence nor their views elicited while going ahead with the projects." She alleged that even the environment assessment policy prepared by the government was false. Suresh Bhai, associated with Raksha Sutra Andolan (protect the trees movement) and also part of the campaign, said that the government and the administration is unaware of the crisis that has taken hold of the districts wherever eight-tunnel power projects are coming up. "People in Selang Gaon have been affected by the Vishnu Gad Power Project. 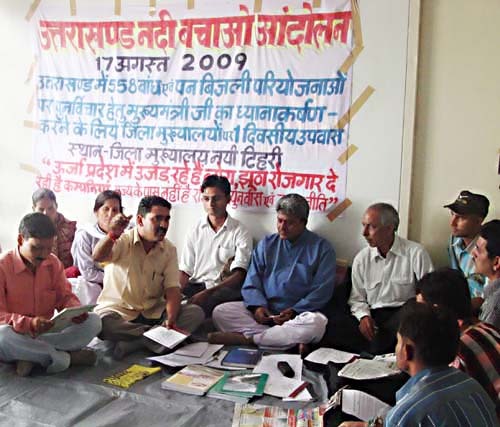 In Rudraprayag, the Kedar Chati Jan Jagriti Sangarsh Samiti has been holding a relay fast for the last 70 days as they have been hit by the Singoli Bhatwadi Jal Vidyut Pariyojana." Lakshman Singh Negi of Janadhar, a NGO, said, "We have undertaken 'padyatra' in Chai Virahi Nadi so that people become aware of the problem of drying rivers. Close to 45 rivers in the state are under threat. It may be due to drying or coming up of power projects." Dehradun, 13 February, 2009 "Save Rivers, Save Life", "People Can't Survive Without Forests, Water and Land". These were the slogans people were shouting at a rally organised by the "Uttarakhand Nadi Bachao Abhiyan" (= UNBA = Uttarakhand Save the Rivers Campaign) here today. The rally started from Gandhi Park and went to the Secretariat. The rallyists also handed over a memorandum addressed to the Chief Minister, to Secretary Power and Program Implementation, Prabhat Kumar Sarangi, demanding preservation of the rivers. The protesters later addressed media persons at a press conference. Suresh Bhai, associated with the Abhiyan from Uttarkashi, said that the expedition had covered 50 river valleys, so far, and their demands were focused mainly on saving rivers, forests, land and ultimately, the human beings. 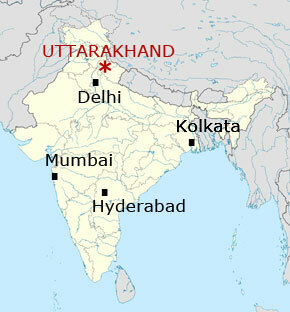 He pointed out that the big dams were dangerous for the existence of Uttarakhand, it being located in a seismic zone. Asserting that the construction of tunnels was also dangerous, he said, "A few people are working for their own profit, not for the general public's profit or the country's sake." Suresh pointed out that Himalayan rivers influenced the whole country and there ought to be a scientific approach. He revealed that the Abhiyan would hold a meeting on 28 February with all MLAs (members of state parliament) of Uttarakhand. (..) "So far, the State Government has done nothing but cheated people." (..) Suresh advocated that there ought to be people-centric water and rehabilitation policies. He stated that those holding responsible posts were working as agents of private companies. Dehradun, 26 March 2009. "Political leaders should understand that they are servants of the people not masters, that's why we need a 'People's Manifesto'. Lok Sabha (national parliament) contestants should answer people's questions" said Convener of Uttarakhand Jan Karvan Manch Radha Bhatt. (..) She demanded that the constructions of tunnels for hydro power projects ought to be banned. She claimed that over utilisation of water as a commodity that could be commercially exploited would lead to drying up of rivers in the long run. (..) "Government is responsible for the destruction of Chaiin village in Chamoli district in the name of 'development'. 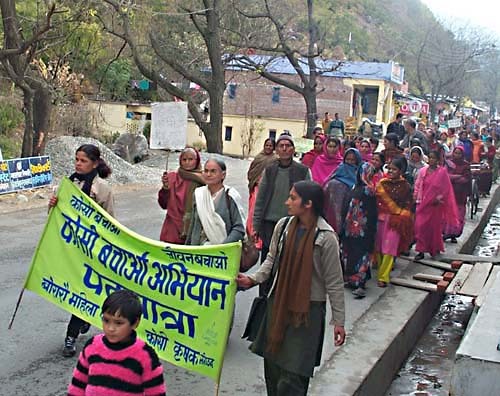 Uttarakhand government is selling our water, land and forests to capitalists," she exhorted.